US Federal Reserve delivered a hawkish stance but failed to surprise. Soft Chinese data released overnight adds to the bearish case of the USD/JPY pair. After hitting a 3-week high of 110.84, the USD/JPY pair battles to retain the 110.00 threshold, as the dollar came under pressure post-Fed's monetary policy announcement. The US Central Bank was generally hawkish but fell short of surprising investors. As expected, rates were hiked by 25 bps, and the wording of the statement suffered several minor changes that acknowledged the lesser need for an accommodative policy. Furthermore, the dot-plot was upgraded and now points to 4 rate hikes this year. Additionally, and starting next January, a press conference will be offered after every single meeting, making all of them "live" ones. On a downward note, Powell said that rates are close to neutral, meaning that they may not need much more hikes, while reiterated that they are willing to tolerate inflation above 2.0%. US Treasury yields hit fresh weekly highs as an initial reaction to the Fed's announcements, with the yield for the 10-year note reaching 3.01%, currently at 2.96%. Equities are also down worldwide, undermined by softer-than-expected Chinese data released overnight. Wall Street closed lower Wednesday and lost further ground in after-hours trading, now at fresh weekly lows and counting. All of this factors favor yen gains. The US will release today May Retail Sales, seen up 0.4% in the month after a revised 0.2% advance in April. The more relevant Retail Sales control group reading is expected also at 0.4% after a revised 0.5% the previous month. The ECB is having its monetary policy meeting and the decision could also affect the pair indirectly. Technically, the 4 hours chart shows that the pair is back below the 61.8% retracement of its latest daily decline, but holding above its 100 and 200 SMA. Technical indicators have retreated sharply from overbought readings and have entered negative territory, anticipating some further declines ahead. 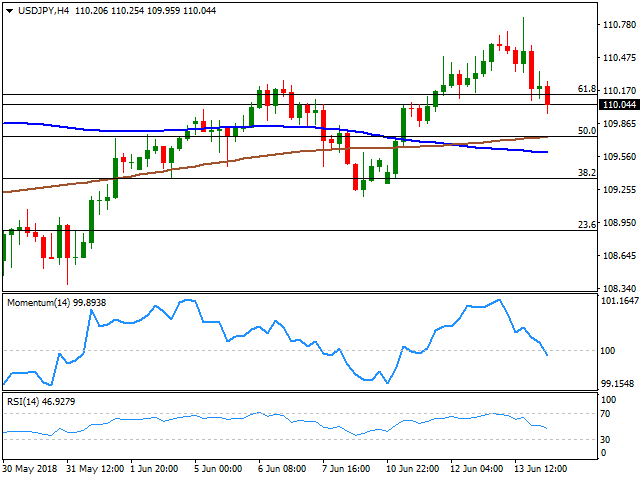 The immediate support is the 109.70 region, where the pair has the 50% retracement of the mentioned slump and its 200 SMA, with further slides targeting the 109.35 level. A steady recovery above 110.15, on the other hand, should take off the bearish pressure.